Recently I've been noticing the ridiculous amount of needles I have at home--both knitting and crochet. As I went deeper and deeper into knitting, my taste in needles changed, and found that each type of needle has their pros and cons. I have opinions on each and one of them, so I thought I'd share them, and compare the needles so people may have an idea before they buy them. I've got all sorts, Bamboo, wood, metal, and plastic. Unfortunately I haven't tried rosewood or ebony. 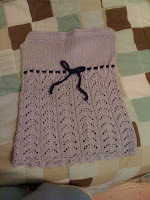 Brandwise, I've tried Clover, Hamanaka, Addi, Susan Bates, Boye, Hiya-Hiya, eKnittingneedles.com, Knitpicks. I'm going to start with general--materials as a whole, first. Plastic-I have no heart for this LOL I got my first crochet hook for myself from a 99c store, saying "heck, I'll give it a shot". It works just fine, but absolute no weight at all, which sounds good but I don't think I like at all. Bamboo-Nice and 'sticky', meaning the stitches do not shift over and slide off. I guess that's why its most common, being perfect for beginners and occasional knitters. Some experienced knitter may find this stickiness irritating, since it slows down the knitting speed. Sticky : Nonsticky = Safe : Fast. While bamboo is a great material for needles, the tips could be chapped to cause MAJOR annoyance. Also, if you get a too-cheap one, they warp. Points could vary, but most I've come across are pretty blunt, which means if you start dealing with k2togs k3togs, you may get frustrated. Still, until you get confident, go for bamboo. Wood-A little less stickier, but still sticky. Points, again varies but the ones I've come across are nice and pointy, which makes those K3togs easier. 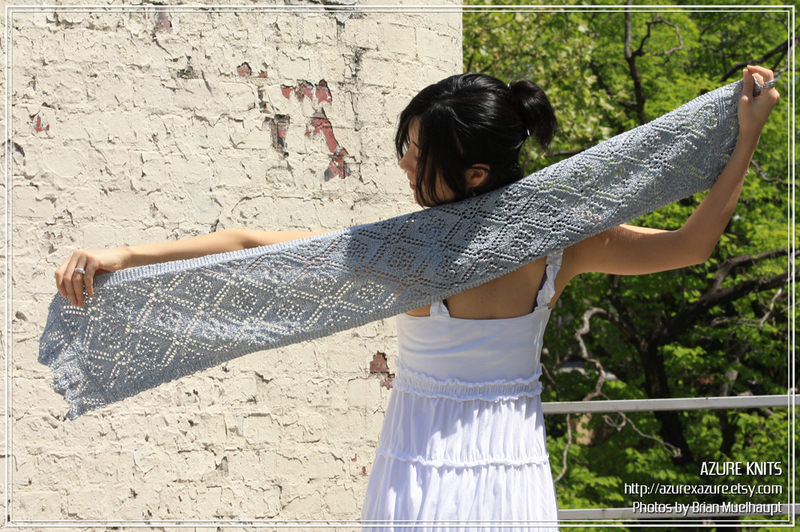 If you're going for lacy project, this may be a good choice. I'm not sure if wood chips often, but so far none of mine has. Metal-If you're going for speed, go for metal! But watch out, if you knit loose, using a bigger needle for the yarn or still not extra confident, prepare for the needle to slip riiight off. Especially DPNs. Also I heard that some people have Nickel Allergy. That can't be good. Otherwise, since metal has very little to no stickiness, it is FAAAST. You'll find yourself knitting like a wind because you don't have to keep on 'feeding' the stitches on the left needle, or at least waay less often. Oki, that said, I'll move on to individual brand infos and my reviews. Susan Bates: I've got straigt, crochet hooks, DPNs. This was the second brand I tried. The metal ones. I'm not sure if they have others. They might have plastic hooks. I had no knowledge whatsoever, so I was like "meh, I'll give it a shot". It's probably very commonly found in local fabric stores--not even yarn stores. Very accessible and quite cheap. But I didn't like it too much. Points are fine, but kind of painful after few minutes. Its also heavy---OHH and I just realized that--that's probably why the needle slides off so easily. I'm sure any user of Susan Bates would understand what "clink--clink..clink..NOOOOO!" is. Their crochet hook however, is not bad at all. At least the metal ones. I still occasionally use them. BUT your hand starts hurting pretty quickly--more quicker as the hook gets smaller. Just the right amount of...lets call it the 'hook indentation', which I will explain in the next section. Boye: I've got a crochet hook, and I couldn't really use it, The hook indentation was too much for me, so it was yes, easy to hook the yarn, but took time to unhook it. Also the strange squiggliness they have on the hook is something I did not enjoy. Poop. Hamanaka: I've got a crochet hook set (raku-raku series), and don't think I'll ever need to buy another set in the size I have in this set. Nice rubber grip for ease, even for smaller hooks and longer use. They're double ended, so you get half the number of needles. Yippeee!! Anyways, I still want to try the clover Pen-E's and the Addi crochet hook, but I'm in no hurry. Addi(Skacel): I've got some circulars(Turbo) and the Click System (Interchangeable). THESE GUYS converted me to metal needles. I randomly came across it in a local yarn store, attracted by the word 'TURBO" and gave it a shot. It was a good decision. Totally turbo, no doubt. Too bad the 16" circulars only costs like $15 each. But my awesome in-laws gave me the click system for Christmas!! I TOTALLY love them. Other than the price, I have one and a half more issue. The fixed circulars are just fine, but the connection of the click system seems to catch the yarn a lot. I'm always a bit scared that it damages my yarn, especially lace weight. I'm slowly migrating to other brand (will be mentioned later) for lacework, not only because of that reason, but also because the tips are rather blunt. Not especially blunt, but blunter than I want for lace. I get scared of the joints of the wire/needle when I do magic loop with these. I'd recommend using a LONG FIXED circulars for Magic loops, because of that reason and the 'connector snag' reason. I would like to try the Addi Lace series one day, I hear it has the turbo fastness and with sliight stickiness to avoid slipping stitches. Hiya-Hiya: I've got couple metal circulars to accommodate the 16" circulars that are not available in interchangeable sets. They don't usually have interchangeable sets under 24" due to the minimum length the needle has to be, the connector, and the wire. Half to 3/4 price of Addi, works just fine for me in place. If you want to try Addi but don't want to pay as much, but still curious about metal needles, go for these. eKnittingneedles.com: I've got tons of circular needles, tons of DPNs (8" and 5"), and crochet hooks. I blame these guys for the amount of needles I have (not in a bad way) LOL. If you want affordable and a 'decent' quality, go ahead and get a set. Unfortunately the bamboos are too blunt and too sticky for me now, but its still JUST FINE. I use their DPNs to finish off hats and do small circumference when I don't feel like magic-looping. I might like magic looping with these 40" circulars than with Addi. 1) its fixed, so no connector problem. 2) the cable gets fatter according to needle thickness, so you don't get as much of that "squeezing the stitches back on the needle" action. Anyways, I will emphasize how AFFORDABLE they are, before I move on to the next. Their crochet hooks gets a mixed review from me. I got this set to accommodate the US sizes and the bigger hooks that Hamanaka didn't have (or, I just didn't get a chance to buy). The bigger hooks worked better, but the smaller hooks had some 'severe/sudden' indentation, so it catches yarn well, but it doesn't release well. Knitpicks: I've got straigts (Harmony Wood=HW), DPNs(Nickel Plated=NP), circulars (both HW and NP), Interchangeable Nickel Plated and Zephyr. Knitpicks was the store I randomly came across one day, when I decided to knit a scarf for my husband (boyfriend at that time). I have a lot of good things to say about Knitpicks, and their needles are no exception. The first HW straights I got didn't work for me, but that was totally my bad. Since I was a super beginner, I didn't know a size 6 was that thin (at least that's what I felt at that time), and also I was expecting something like a size 10. Anyways, I ended up getting a clover size 10 that time, but I still use them. and like them a lot. Just the right amount of stickiness, and pointy. It does start hurting your finger a little, but not as bad as Susan Bates. The only problem I had with the HW circulars are that the needles pop off every once in a while. It's fixable with super glue, but its shocking when it happens. Nikel plated DPNs are nice and sharp, slippery, but I guess it has a veery slight stickiness since it doesn't fall off as easily. I'm not saying it doesn't. If you use lighter weight yarn, yes they can totally fall off. haha. My recent favorite is the NP circulars, especially because I'm doing more and more lacework. The points are BEYOND useful for lace. I'm sure most people will recommend the HW for lace since it has a bit more stickiness, but I like using NP. I'm going to try out the Zephyr interchangeable soon, and probably will end up trying out the other 'option needles'. As far as I can see in those photos, the connector seem more seamless than Addi. Oh well, let's see. As expected, the connector is way seamless compared to Addi. You'll only notice the yarn getting caught when the screws get loose, but if you use the 'key' that comes with the cables, both NP and Zephyr works like a fixed circular. Amazing. Now I'm less scared when I use lace weight. The NP Options is pretty much the exact same as their fixed circular. I LOVE it. I'm almost tempted to say I like it more than Addi, but I'm not going to, because my beloved mother and father-in-law gave them to me for Christmas. On the other hand....I think its the first time I was ever disappointed with a Knitpicks product. I like the cheapness. But I found out I just...cannot like any sort of acrylic thing when it comes to knitting. Or maybe it doesn't. But in any case I 'feel' the squeak vibration through my fingers up to my spine, and I cannot knit with it more than 3 minutes. I gave a second chance, convincing myself "it was just a bad yarn+needle combination..." since I was using Shine Sport, a rather slippery cotton and modal yarn. But no, I tried with wool--merino...and it still squeaked. This made me saaaad. I took it on an airplane, hoping that the airplane noise will let me not notice the squeak, but like I said earlier, I feel that vibration so it was no use. If you're ok or used to this squeakiness, this may be the perfect needle for you. I really envy those people. I could have gotten a super affordable set from Knitpicks. I probably won't use this other than placeholders or emergency needles, like if I ever get my NP confiscated at an airport. If I hadn't liked Knitpicks as much as I do, I would have totally returned them. Still, I have by no means lost faith in Knitpicks. They've done soo much more good that one 'blah' doesn't destroy them for me. That's why I'm going to kinda demote and promote them at the same time by saying "Forget Zephyr. Get their NP or harmony. They're a bit more pricey but not tooo much, and worth waaaaay more". I almost want to keep KnitPicks as unknown as possible but I may be too late. They are pretty darn affordable and great quality. I hope these notes helped some people. I will update as I come across more needles! which..I probably shouldn't regarding how much I have already. haha. 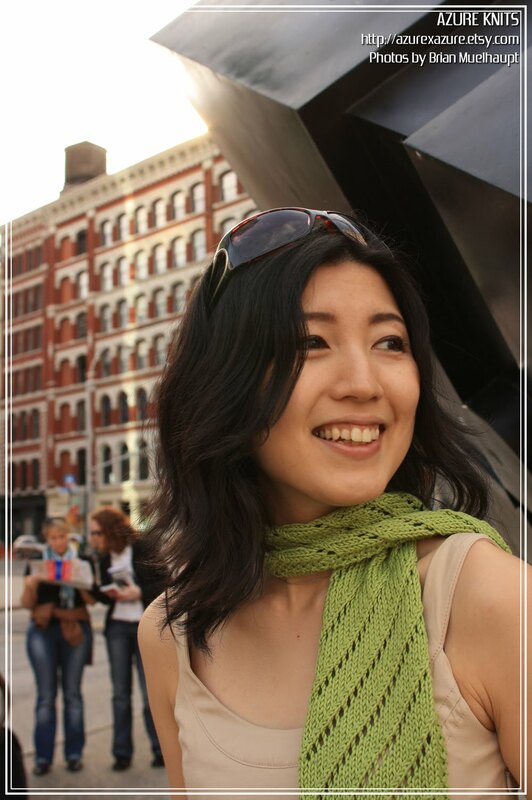 This scarf is for my sister! 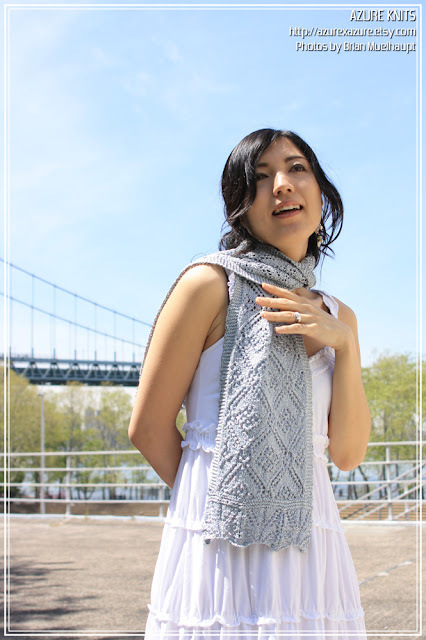 The original pattern, Renewal Wrap is suppose to be a 'wrap' like its name, but since I had limited amount of time/yarn it became a scarf. But oh man, lace..is FUN. I had a couple of super simple stockinette projects with pretty hand-dyed yarn, but they are moving sooooooooo slowly since that brain-twisting tedious messiness of lace seems to be a perfect entertainment for a girl who decided to become an animator :P--I keep on working on the complex projects. Back when I made these first lacy projects (green one was done in sport, purple in worsted), I was too afraid of the lace that didn't just go up vertically, but I'm glad I tried it this time. Now I'm trying out lace in Fingerling and actual LACE weight yarn. Let's see how it goes.